One of the finest British films of 2011, Tyrannosaur follows the story of two lonely, damaged people brought together by circumstance. Joseph (Peter Mullan) is an unemployed widower, drinker, and a man crippled by his own volatile temperament and furious anger. Hannah (Olivia Colman) is a Christian worker at a charity shop, a respectable woman who appears wholesome and happy. When the pair are brought together, Hannah appears as Joseph's potential saviour, someone who can temper his fury and offer him warmth, kindness and acceptance. As their story develops Hannah's own secrets are revealed – her relationship with husband James (Eddie Marsan) is violent and abusive – and as events spiral out of control, Joseph becomes her source of succour and comfort. Widely acclaimed and described by Empire as "Riveting, uncompromising, brilliant," Tyrannosaur is a consistently gripping drama, the writing/directoring feature debut of award-winning actor Paddy Considine (Dead Man's Shoes, The Bourne Supremacy), one that boasts a pair of powerhouse performances from Peter Mullan and Olivia Colman. 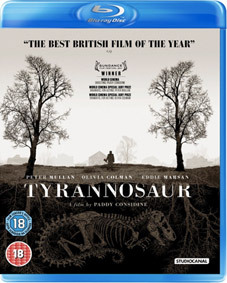 Tyrannosaur will be released on UK DVD and Blu-ray on 6th February 2012 by Studiocanal at the RRP of £17.99 for the DVD and £22.99. The Making of Tyrannosaur Booklet.